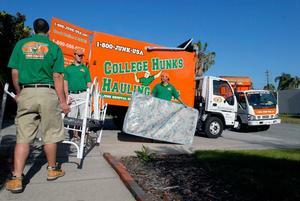 TAMPA, FL--(Marketwired - Oct 29, 2014) - Offering the "evergreen" service of moving and/or junk removal at reasonable prices is why College Hunks Hauling Junk continues to be one of America's most successful franchise operations, announcing revenue growth of 42.6% between 2011 and 2013. In addition to being a valued service, College Hunks Hauling Junk also succeeds by being much more affordable in terms of start-up costs. Most College Hunks Hauling Junk franchises are up and running for between $95,000 and $207,950, and they are very easy to scale, in addition to having very turnkey startup financing options. 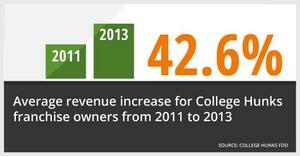 Average revenue for franchise locations was $442,504 in 2013, which illustrates a great return on investment. And sales tend to grow over time. The original business, which set up shop in Washington D.C. during 2005, brought in $2.2 million in 2013, up from $500,000 in 2005. Those solid figures demonstrate the value, and the growth potential, of this carefully thought-out junk removal and moving franchise's business model. "Nobody likes the idea of hauling away the stuff they don't want any more, and nobody enjoys the moving process," said Nick Friedman, College Hunks Hauling Junk co-founder. "That's why our brand is never going to go out of style. We're not trendy; we're here to stay." Further, Friedman pointed out that College Hunks Hauling Junk has at its core a strong dedication to solid customer service, backed up with multiple avenues of sales and marketing support for franchisees. "From our call center that answers consumer questions and books appointments for our franchisees to our online presence that does the same, we work as hard as our franchisees do to grow their business," Friedman said. "Combine that with training, marketing and other services, and you've got a franchise opportunity that has all the tools in place for success." Even though College Hunks Hauling Junk is less than a decade old, it's expanding rapidly in many markets -- but those ground-floor opportunities won't last long. "Most of our franchise competitors have sold out or are offering very limited territory sizes," Friedman noted. "We've doubled in size in the past two years, but we still have prime territories available for now, so this is the time to act." College Hunks Hauling Junk offers a unique benefit to entrepreneurs — a junk hauling business model and a moving company business model that are offered under a single franchise fee. College Hunks Hauling Junk franchisee Steven Nickels explains why he likes the junk removal franchise and moving franchise.